As I was on one of my never-ending quests to find new and interesting brands, I came across Aquatico Watch. They have several cool models but the ones I liked most was their Nautilus II diver. Long story short, I was able to get one from them to review and I was pretty happy with what I saw. The dial on the Aquatico is clean and simple, as a dive watch should be. This is a simple three-hander with a date window at the three o’clock position. The hour and minute blade hands are large enough to be easily seen during any dive condition. I really like the colors on this model; the blue sun burst face with the red accents on the index looks fantastic. One thing that’s done on this dial which I really like is the tapered index ring. This really adds depth to the dial. Protecting all of this is a AR-coated sapphire crystal. To be a good professional dive watch, the case needs to be built to take some abuse. This watch is built from solid 316L stainless steel with a brushed finish. For measurements, it comes in at 44mm in diameter, 53mm lug to lug, and 14.5mm thick. This translates to a very solid and heavy-duty feel. The 120 click bezel has a ceramic insert which can take a good amount of abuse without scratching. Movement of the bezel is tight, but not too tight where it would be an issue under water. Water resistance is an excellent 500m. For the few technical saturation divers (editors note: also known as “none of us”), there is an automatic helium escape valve. The lume on this watch comes from Swiss RC-Tritec C3 Super-luminova. This provides a great glow that last for quite a long time. As you can see there is a lot of lume used in the watch and it looks great. The stainless steel bracelet on the Aquatico is done in the same brushed finish as the case. Lug size is 24mm, but tapers down to 22mm at the locking clasp. The bracelet is well made and has a very durable feel to it. There is no diver extension on this bracelet, but that’s ok. This watch doesn’t just come with the bracelet, it also comes with a rubber dive strap. The rubber strap is thick, but not so much where it would feel bulky on the wrist. 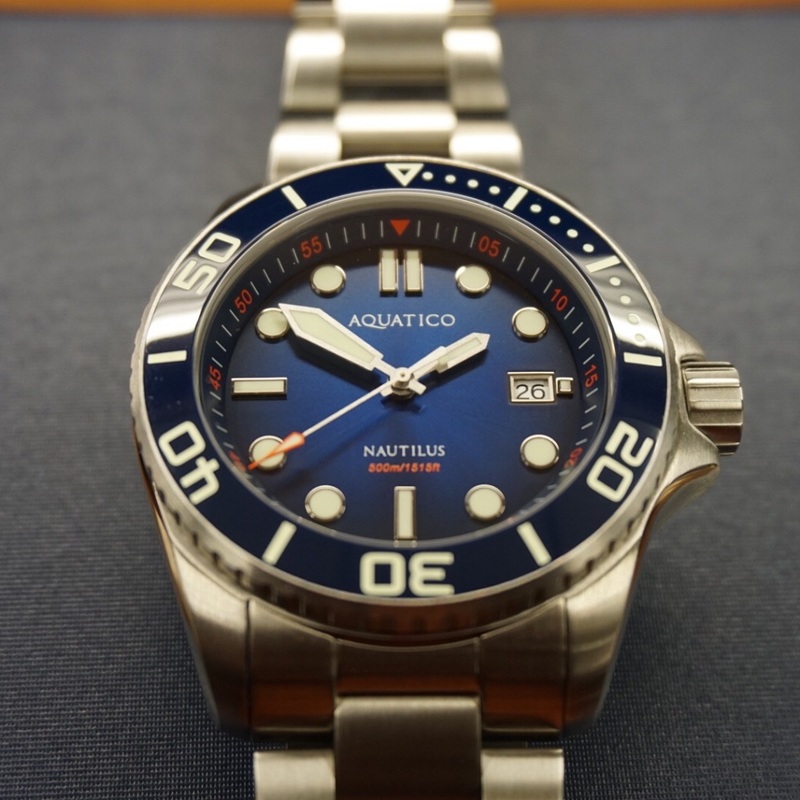 I am pretty impressed by the Aquatcio Nautilus II. This watch doesn’t just look great on the wrist, it’s also more than capable of doing its job as a real dive watch. This watch has a retail price of $349 USD but is selling for special price of only $299 USD. Not a bad watch with a Seiko NH35 automatic movement, ceramic bezel, and 500m in water resistance. If you like what you see, go check them out at aquaticowatch.com. Who’s it for: Divers and desk divers. The best thing about it: The build quality. MOVEMENT – TMI SEIKO NH35, Japan made Automatic, 25 jewels, seconds stop.